Established in 2008, at Pune (Maharashtra, India), we, “Srinivasa” are one of the leading manufacturers and suppliers of a high quality assortment of Pharmaceutical Equipment, Pharmaceutical Furniture, Clean Room Furniture, Canteen Equipment, Canteen Furniture, Material Handling Equipment. In our product range, we offer Cupboard, Locker, Table, Chair, Stool, Bain Marie, Canteen Table, Pass Box, MOP Trolley, Material Transport Trolley, Locker, Linen Trolley, Ladder, Hopper, Hand Wash Basin, Dust Bin, Tea Trolley, Sink, Rack, Plate Rack, Pallet, Heavy Duty Trolley, Heavy Duty Hand Truck, Conveyor, etc. Our state-of-the-art infrastructure facility has made us capable of manufacturing and supplying products in compliance with international quality standards. The raw material used in the manufacturing process is also tested by our experts on well-defined parameters in order to maintain quality right from the initial stage. Moreover, the offered products are also safely packed, using quality packing material to prevent losses during transit. Under the leadership of our mentor, Mr. Manoj, we have become one of the leading manufacturers and suppliers in this industry. His constant motivation and in-depth knowledge has enabled us to attain a reputed position in the market. Manufacturing of Industrial Furniture & Trolleys. We are counted as one of the leading manufacturers and suppliers of Pharmaceutical Equipments, Pharmaceutical Furniture, Canteen Equipment, Canteen Furniture and Material Handling Equipments. These are manufactured using the finest grade factor inputs, sourced from trustworthy vendors so that the finished products are as per global quality standards. Our entire product range is tested for their quality parameters, reliability and durability at our advanced production unit. The high quality equipment manufactured by our company has vast industrial use. Our products owing to their quality have become a corner stone in our practices aimed at client satisfaction. The high grade equipment manufactured by us finds use in hospitals, nursing homes, research laboratories, clinics, hotels, restaurants, hostels, and cafeterias. Apart from hat our equipments has a vast industrial and domestic use. We are very much professional in our approach when it comes to dealing with our clients. We have well equipped R&D department which has aided us in coming at par with latest trends of market. The researchers manning our R&D unit conduct regular researches and market surveys, which are inculcated for the betterment of our products. Our department keeps tab on the newest processes in the industry and helps us in bettering our services. We have been able to come up to the standards laid by the industry internationally. Making us to live to the expectations of our customers, we are benefited by the presence of a dedicated team. Each of our team members is highly qualified and has relevant experience in their area of work. Our team has enabled to win the hearts and minds of a huge clientele. Making all our endeavors a success, our team comprises of engineers, technocrats, fabricators, quality controllers, and sales and marketing personnel. Thanks to the efforts of our team, we are counted among the leading in the industry. We are known for our ethical business practices and client oriented approach in the global markets. Our sole business motto is to deliver premium range of display & storage shelving systems at most reasonable prices to our valued clients. Our clients are well known in their specific field of work and they have placed repetitive orders for our products. 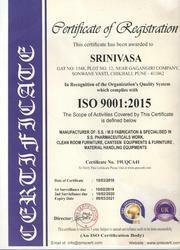 This is mark of the excellence of our products. Further, by integrating ethical work practices and transparency in our transactions we are able to gain the trust of our honored clients. With the help of a wide networking in the industry, we are able to facilitate our customers to acquire the best and the most suitable range at market leading prices. Mega Rubber Technologies Pvt,Ltd –Hossur -Tamilnadu. As one the leading manufacturing company offering flawless range of pharmaceutical, canteen and material handling equipment, we have carved a niche of our own in the market for quality compliance. We have made our presence felt in the global market because of our quality fulfillment.